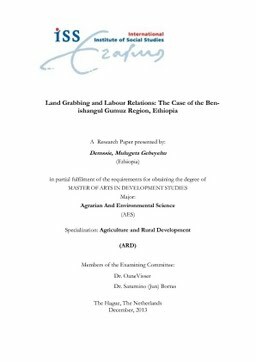 This study studies the current land grabbing and change in labour relations from a political economy perspective, in the context of Ethiopia, based on the case study research in Benishangul Gumuz region. It strives to uncover the implication of wage labour to the livelihoods of workers and how peasants and workers resistance changes the forces of national capital. The study takes its root from the view that when capital needs land, but not labour of locals or it perhaps needs land and cheap labour (Li, 2011). And also the study has used the current concepts and theories of land grabbing from the context of national capital (Oya, 2013, forthcoming) and peasant resistance from below (Borras & Franco, Forthcoming). Firstly, the study has found that the Ethiopian government has dual policy approach; promoting large scale commercial agriculture in low land areas and high value crop production and global market link in the highlands. The project and re-location programs that are facilitated by the state seriously constrained shifting cultivators specifically whose livelihood is depend on the immediate environment. Further, locals lost their cultural entities and indigenous knowledge. Second, the land of locals is needed by the project, but their labour is not needed as they are perceived as having poor working culture. But, the reality is locals demand wage labour which is evidenced by their employment in the local smallholder farms. The farm rather needs cheap migrant labour that is more trapped by poverty which is important for the profit of the farm. Further, the farm oppresses and exploits migrants with a little wage. As a result, labourers leave to smallholder farms for better wage, basic services, security and where there are good social relations. Therefore, wage labour for migrant workers is unlikely to meet their livelihood needs it rather increases their poverty. Third, regional workers affairs office facilitates labour migration with the help of labour agencies. But, officials do not take attention to labour exploitation and oppression by farms. The challenge to not take regulation of labour issues is that the office is very far from the farm areas. In addition, there are no bottom level labour authorities, trade unions and NGOs intervene in labour affairs. So, these make investors to decide labour issues by themselves (laissez-faire approach). Finally, the claim of labourers in the farm is often backed with unkept informal promise and oppression. But, claims are unreported due to the distance of institutions and partly by the silent-nature of labourers. Also when labourers claim to the outside local administrations it is rare that they get attention for their claims. Due to the combination of the above factors, there is no or little improvement of labour rights or if there it longs for a very few days. In general, different class interests, directions of resistance and intra-rural conflicts have led to the difficulty of forming collective actions.